Place cookie mix in large bowl. With pastry blender or fork, cut in butter until mixture is crumbly and coarse. Lightly press crumbs in bottom of pan. Bake 10 to 12 minutes or until golden brown. Cool. In large bowl, beat condensed milk and lime juice with electric mixer on medium speed until smooth and thickened. Remove 1 cup of the whipped topping; set aside. Fold remaining whipped topping, yogurt and food color into milk mixture. Spoon into cooled crust. Cover and refrigerate about 1 hour or until set. To serve, cut into 5 rows by 4 rows. 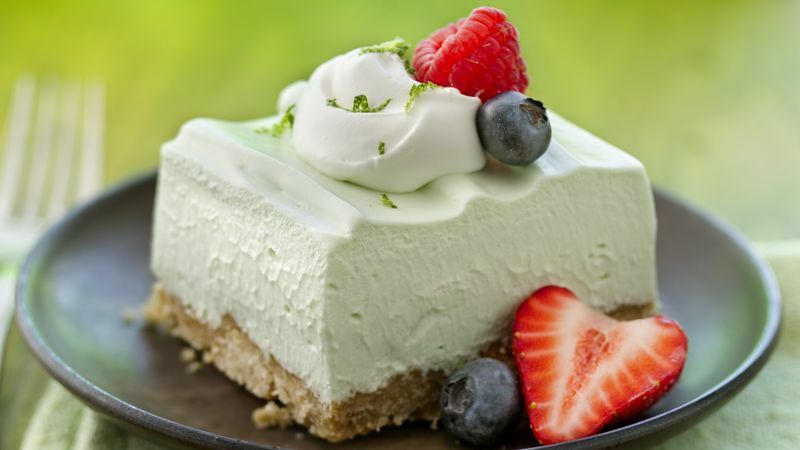 Garnish each serving with a dollop of remaining whipped topping, lime peel and fresh berries. Cover and refrigerate any remaining dessert. If Key limes aren’t available in your grocery store, look for bottled Key lime juice near the other bottled juices.